Packaging: Standard PET container for the soap, plenty of room to load with room at the top. The waterproof labeling across the entire line of soaps features Art Noveau pieces which I very much like. Very tasteful. 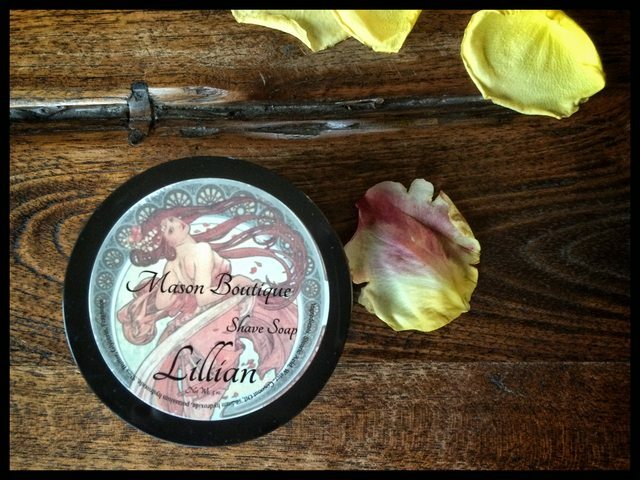 Scent: The scent profile of Lillian lists bergamot, lavendar, anise, nutmeg, juniper, patchouli, leather and labdanum. I couldn't wait to open the tub and take a deep breath... to not much. There was a scent beyond soap but just barely and so faint I couldn't discern what it was. On use, it did open up and I could particularly pick up the leather but not much else. Really too bad as I thought it sounded great. Performance: It really does shine both during and post shave. With shea butter and glycerin I found the soap extremely easy to lather even having hard water and it offered superb cushion and slickness during the shave. I was very pleasantly surprised. I have neutral skin but found the post shave to be moisturizing and conditioning as well. Customer Service: I did reach out to Jenny Marting as the scent was so mild I wondered if perhaps it was an older tub etc. She promptly replied, indicating that this and one other of the line are very complex and that if additional fragrance were in fact added it would likely impact the performance or increase likelihood of negative reaction from users with sensitive skin. She in turn proactively offered an alternative to ship out which was completely unexpected and demonstrates an artisan with ultimate confidence in their product line. Final Thoughts: I think Mason Boutique has done a nice job with their GTM, creating a theme across their offering using Art Noveau imagery and vivid descriptions. Having said that, if you are looking for a mildly scented soap, uniquely packaged at a fair price then this is well worth trying. If you prefer more strongly scented soaps, I would hold off and perhaps make another selection from the Mason Boutique product line.